If we have to have more superhero movies, and it would seem we've no say in the matter, let's just hope they at least try to be as disruptive and refreshing as Shazam! After early misfires in the shape of Justice League and Man of Steel, DC, at long last, have got another one right. Full of life, laughs and (thank God) light, Shazam! is the kind of carefree superhero film that reinvigorates the fantasy of actually being a superhero. For so long now, the "with great power comes great responsibility" mantra has sucked the enjoyment right out of the genre (at least on the DC side), making the very idea of having extraordinary powers seem like a complete drag. Here, though, thanks to the wide-eyed, goofy-grinning performance by leading man Zachary Levi, it seems like an absolute blast. 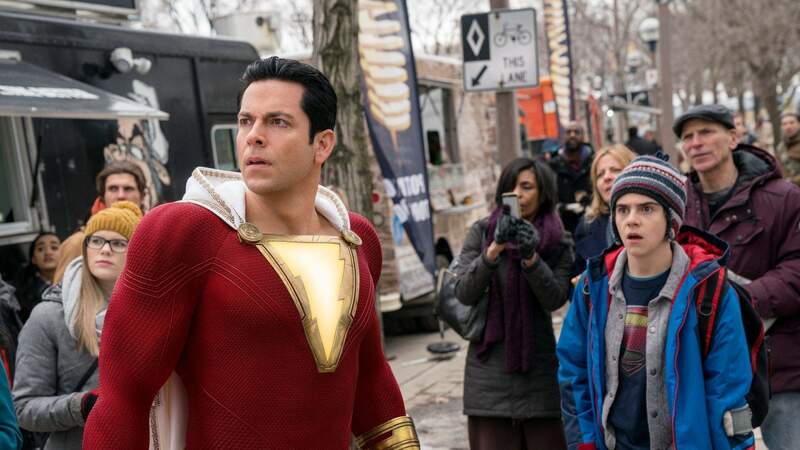 Levi plays Shazam (Solomon, Hercules, Atlas, Zeus, Achilles and Mercury all rolled into one), a muscle-bound, invulnerable and electricity-enhanced hero whose magical powers lie within his alter-ego, 14-year-old foster kid Billy Batson (Asher Angel). Batson is given his powers by an old wizard in a last-gasp effort to stave off the impending attack from a gang of demons known as the Seven Deadly Sins, who take up residence within the deliciously-evil Thaddeus Sivana (Mark Strong). Where Shazam! departs from most other films of this genre is how long it spends with Batson and his foster-care brother Freddy (Jack Dylan Grazer) as they explore the possibilities and powers stemming from the sudden discovery of superhuman abilities. Can Shazam fly? Is he bulletproof, or is it just his suit? And, most important of all, can they buy beer now that one of them looks like an adult? It may feel a little childish at times, but that's actually a testament to writer Henry Gayden and director David F. Sandberg (Annabelle: Creation), since children is precisely what Billy and Freddy are. Perhaps even more critical to Shazam! 's appeal, though, is its heartfelt relationships. It's a family film about family – the search for a missing mother, the sting of a father's rejection and the love from a family united not by blood but by circumstance. Led by foster parents Victor and Rosa Vasquez (Cooper Andrews and Marta Milans), Billy's new foster home brings together an impossibly endearing gang of multicultural misfits: Mary (Grace Fulton), Pedro (Jovan Armand), Eugene (Ian Chen), and Darla (Faithe Herman). Orphans are just about the superhero genre's most consistent trope, but here it's explored in an entirely new way, and the foster family scenes are amongst the film's best. A word of warning, though: whilst Shazam! is a big bunch of laughs and a whole lot of silliness, there's definitely enough to spook younger viewers. The Sins, for example, are like the red-eyed Gozer dominions from Ghostbusters, and their nightmarish takedown of a company board meeting in the film's opening stages isn't without a heady dose of horror. Still, the rest of the movie offers mostly light fare, and some of its greatest gags are also those most closely linked to the superhero staples (Strong's villainous speech during the film's climax being the best of the bunch). In all, Shazam! is like Superman's goofball cousin; a casual, crazy and cheeky take on the childhood fantasy of being bigger, faster, stronger and, above all, wanted.